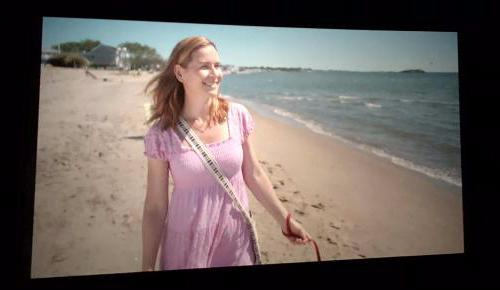 I play the lead role of Lily in Shira Levin's beautifully written independent feature film, STARFISH, now available on Indieflix! 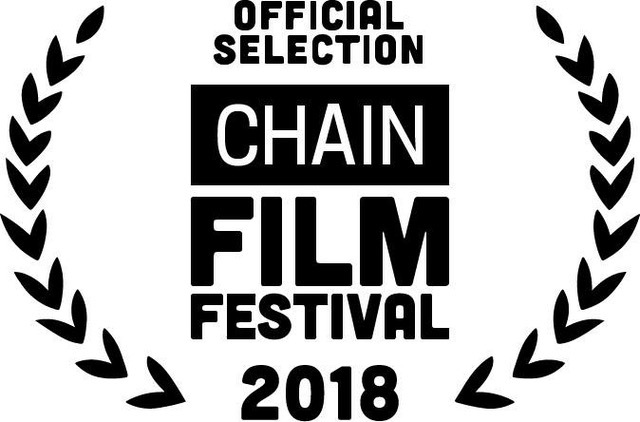 "Starfish" had its NYV premiere at Chain NYC Film Festival in August. It then went on to the La Femme International Film Festival in LA, Mystic Film Festival - where it was awarded the Audience Choice Awards - and then on to Black Bear Film Festival, followed by Veritas Film Festival. See the "Starfish" trailer here. 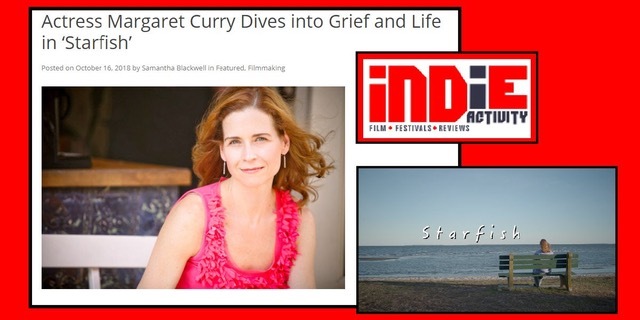 Actress Margaret Curry confronts grief, healing, family, friendship and the strong bond between dogs and humans starring in the new indie feature, STARFISH. From writer/director Shira Levin, the film is currently on the festival circuit and will screen next as an 'Official Selection' at LA Femme, Mystic and Black Bear Film Festivals. 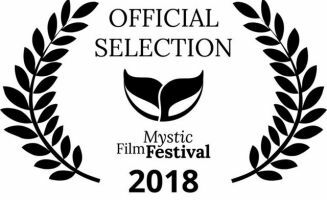 STARFISH follows Lily (Curry), a librarian and artist in a small seaside town, struggling with intense feelings of grief over the recent death of her dog, and of her father three years earlier. 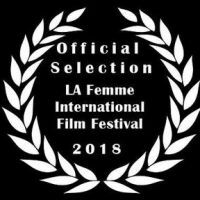 Unexpectedly, her estranged sister asks her to watch her teenage daughter for a couple of weeks, setting in motion a series of life changing events: an unavoidable confrontation between the sisters, the loss of a close friend, a bond between niece and aunt, a hint of love, and the stirring up of many emotions that require Lily to open her heart and re-engage with life. Curry was excited by the opportunity to dive into this universal story that highlights the interconnected aspects of loss, healing and the cycle of life. Curry shares, "I read the description of this female-driven film in the casting notice and knew that I had to play this role. I had suffered a series of major losses several years before, including my parents, a brother and two beloved cats. I knew that I understood where this woman was and the way that grief can color one's life. 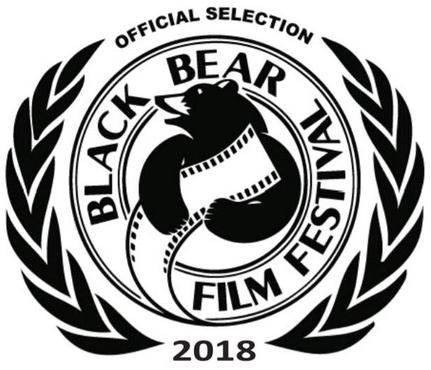 I am so grateful for Shira Levin and her beloved real life dog, Tyler, who inspired her to create this film -- his story has changed and inspired me, through the making of this film." Originally from Houston, Texas, Curry has earned a solid reputation as an award-winning actress and singer. She has extensive training and experience on stage, including over 300 performances as Titania in the Off-Broadway hit Fools in Love, The Musical and two Equity National tours playing Karin in the musical Church Basement Ladies. 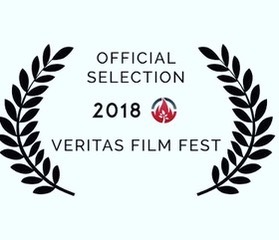 On screen, she shines as the cutthroat, out-for-justice Attorney Andrews in the action feature film, Diamond Ruff, directed by Alec Asten and produced by Young! Studios. As a singer, Curry has shared the stage with such luminaries as Leslie Uggams, Carol Channing, Billy Stritch, Amanda Green and Ann Hampton Callaway. She has appeared as a soloist or featured performer at the Kaplan Auditorium at Lincoln Center, the Allen Room at Jazz at Lincoln Center, The Hudson Guild Theatre and many of NYC's hottest nightclubs and cabaret venues. Currently in production, Curry is working hard co-writing, co-starring and co-producing an original web series project. And coming in February 2019, Curry is directing the New York City premiere of JP Sclafani's new original one woman play, An Evening with Eva: Loving the Monster, as part of the Hudson Guild Theatre's Winterfest Festival. A Houston, Texas native, Margaret is an award-winning actress and singer. She has appeared in more than 300 performances of the Off-Broadway hit ‘Fools in Love, The Musical’ and two Equity National tours in the musical ‘Church Basement Ladies.’ On screen, she is best known as a cutthroat attorney in Alec Asten’s action film, ‘Diamond Ruff.’ She has sung alongside numerous legends and appeared as a soloist or featured performer at the Kaplan Auditorium at Lincoln Center, the Allen Room at Jazz at Lincoln Center and The Hudson Guild Theatre. 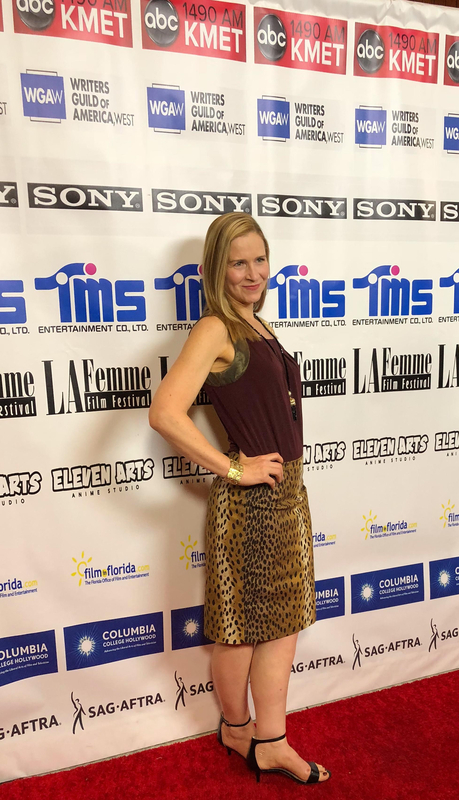 Additionally, Margaret is creating a new original web series project and is set to direct the New York City premiere of JP Sclafani’s new original one woman play, ‘An Evening with Eva: Loving the Monster,’ at the Hudson Guild Theatre’s 2019 Winterfest Festival. 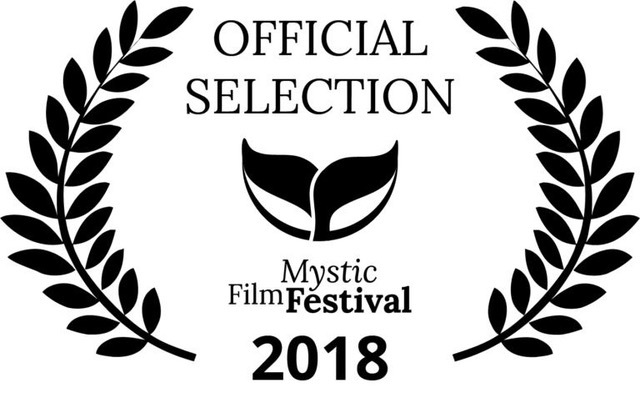 Currently on the festival circuit, Margaret turns in a memorable performance as the grief-stricken Lily in Shira Levin’s new film ‘Starfish.’ The film premiered at the NYC Film Festival in August and screens next at the LA Femme, Mystic and Black Bear Film Festivals. indieactivity: How did you get into acting? Margaret Curry: I always loved play-acting. I was that kid who did commercials in the bathroom mirror. I was obsessed with the classic, old Hollywood movies. I was in choirs throughout my school years, and so always participated in the class musicals, but always playing townsperson #8. I was too shy then to audition for the lead roles. Finally, once I got to college, my desire to act surpassed my fear, and I auditioned for one of the leads in the musical. I got the part! I played Miss O from the Maria Irene Fornes and Al Carmines musical ‘Promenade.’ Once we started rehearsals, that was it for me. I was hooked. I remember leaving rehearsal one night and sitting on some steps looking out at the night sky, crying from the sheer happiness I felt. It is amazing that I graduated because all I wanted to do was act from that point on. indieactivity: What helps you create a character? Margaret Curry: It’s always different. Every role has a different “in”, requires a different approach, which is what I love about it. Sometimes it might be starting with something physical. It could be going deep into researching the world of the character, getting heavily into the given circumstances. I might discover something that sparks the core of the character in researching the writer and reading all they’ve written, if it is a play, or if a screenplay, watching their other films or tv shows to become more intimate with them and their voice. Usually, it a blend of all of those, plus doing deep personal work to then bring what it is that I have to bring to the picture – my humanity and unique, intimate understanding of the character. indieactivity: Is there a specific moment when you know you’re fully prepared? Margaret Curry: Never. A human being is so infinitely faceted. There is always more and more to unearth and discover about a character. The questions lead to more questions which lead to more questions. That said, I suppose there is a place within where you sort of feel “ready” to go, to live the moments of the script, to step off the cliff with your scene partners and just experience, together. That “jumping off” place where the script becomes more that any one of its parts as we all contribute what we have and ideally elevate it off the page beyond what anyone even dreamed it could become. Margaret Curry: Lily is a librarian and artist in a small seaside town, struggling with intense feelings of grief over the recent death of her dog, and of her father three years earlier. Unexpectedly, her estranged sister asks her to watch her teenage daughter for a couple of weeks, setting in motion a series of life changing events: an unavoidable confrontation between the sisters, the loss of a close friend, a bond between niece and aunt, a hint of love, and the stirring up of many emotions that require Lily to open her heart and re-engage with life. As happens in life, Lily is stuck and not necessarily looking to unstick herself. (That stuck place can be so comfortably uncomfortable.) But life has other plans for her, as life often does. Thank goodness. Life always wants us to live, doesn’t it? indieactivity: What was your first impression of Lily? Margaret Curry: I read the description of this female-driven film in the casting notice and knew that I had to play this role. The story touched me deeply. I had suffered a series of major losses several years before, including my parents, a brother and two beloved cats. I knew that I understood where this woman was and the way that grief can color one’s life. I know how disconnected grief can make you feel from all that you usually love. I really wanted to explore the question: how do you recover from loss? What makes us keep on loving again and again? I loved that the story was set in a small, seaside town. That Lily was a seemingly “ordinary” woman living a seemingly “ordinary” life — whatever that means! Because she is living a life that is important to her, the way all of our lives are important to us. I love stories that explore those seemingly small moments in seemingly ordinary people’s lives that actually can hold such astonishing beauty, courage and risk. Stories of the human spirit and all that it leads people to do. The way we humans keep getting back up to do it all over again. The resiliency of the human heart. That is Lily and Toby’s story. I also loved that the story did not revolve around a woman trying to find a man! Yes! I am so grateful for Shira Levin and her beloved real life dogs Boo and Tyler, who inspired her to create this film — their story has changed and inspired me, through the making of this film. They still inspire me. Probably always will. indieactivity: How do you keep your performance fresh during long hours on set? Margaret Curry: I so appreciate all the work I have done in industrials, commercials and all of the theatre and film jobs I have ever had. Through all the experiences I have had on sets and in shows, I’ve learned how to take really good care of myself in a production, how to focus and how to conserve my energy for the creative work. I have a solid acting technique as a base, so I can use that when I need to. It always helps to really love and believe in the project at hand. I will go through fire for a story I am passionate about. indieactivity: What’s the best advice a director ever gave you? Margaret Curry: I was just talking about this with a fellow actor. One of the best pieces of advice I ever got was from a director named Michael Beckett. It was in regards to working on a scene, in the moment. He said, “Sweetie, don’t reach for it. Don’t move a muscle.” Meaning, don’t push for an emotion. Just allow it happen. That comes back to me so often. So brilliant. Sounds simple, right? It is actually quite deep and can be quite challenging! I am always learning again and again about the delicacy of the actor’s system, our body, our “instrument.” We have to practice to be both incredibly powerful and incredibly relaxed all at once. indieactivity: Any other tips for actors you’d like to share? Margaret Curry: Breathe. Breath takes care of so much. Breath connects us to our bodies and to the collective unconscious. Once you have done your preparation, then it is time to breathe and go on the journey with your partner(s.) Breathe. indieactivity: What would you like to change about the business? Margaret Curry: I would love to see expansion in the mainstream around what kinds of stories are being made and who is being cast in them. The world is a rich place filled with diversity: of gender, race, age, culture. 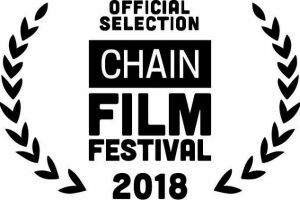 I want our films, televisions and stages to reflect the whole world experience, not just the narrow slices that are currently being funded again and again. I love what is beginning, finally, to shift around race and gender. It would be amazing for there also to be shifts in what is considered beautiful and interesting to watch on screen. For example, to include faces that have lines in them from the life experiences lived, and not just youthful ones. Those narrow slices are so boring over time. There is so much more for us all to explore and see reflected back to us. indieactivity: Who is your creative idol and what do you love about their work? Margaret Curry: There are so many people who inspire and fuel me. Actors, directors, writers, producers…Some are recognizable names, some are hardworking creators who are not well known but who are showing up and doing amazing work. These days, I am crushing hard on Laurie Metcalf, Ava Duvernay and Ann Dowd. They are all bold artists who “go there.” And Jane Campion! “Angel at My Table” was a revelation to me. Her visual style and the the often-difficult stories she has found a way to tell keeps me moving towards the stories that I want to tell. I also admire the teachers and mentors I have had so much: their love of the craft of acting and their generosity in sharing it with their students always fills me with gratitude, and that keeps me fueled to keep at it no matter what.